The World Rides in Hong Kong: See Any Place You Remember? See Any Place You Remember? Can you see your country? 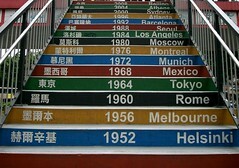 The steps to a footbridge in Hong Kong chronicle the locations and dates of past Olympics. Guess what's on the top step!